Item in StockItem out of Stock | Order Before 3pm Mon-Thurs for next day delivery on orders over £25.00 (see delivery information). Approved for holding hazardous dusts of class M.
Wet and dry dust extractor. Tool cases of various systems can be simply positioned on the extraction head and secured. The 7.5 m mains cable and 4 m hose provide a large working radius. With PES flat fold filter and electronic shut-off for outstanding wet extraction performance. 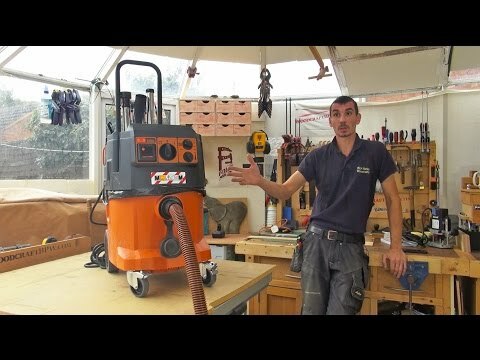 The Fein DUSTEX 35 MX AC M Class Dust Extractor 110v comes with a push bar, PES flat fold filter, disposal bag, 4 metre suction hose 35mm in diameter, tool collar with suction force regulation, stepped collar, 2 suction pipes (metal), 1 combi nozzle with interchangeable inserts, 1 crevice nozzle, 1 suction brush, 1 elbow. 35 litre tank volume. 1380w maximum power input. 4320l/min airflow. 254m/bar max vacuum. 110v. Order before 3pm for next day delivery on orders over £30.00. Free Next Day Delivery on orders over £75.00. We aim to supply all products marked “in Stock” over £30 on a next working day basis provided the order is placed by 3.00pm. Free Next Day Delivery on orders over £75.00 including vat to UK Mainland. Under £75.00, a carriage charge of £5.95 will be charged. orders between £0.01 and £24.99 a carriage of £3.95 will be charged this will be sent via royal mail recorded delivery on 2-3 day service to UK Mainland. No deliveries will be made on Bank Holidays. Saturday delivery and Before 12 Noon delivery options available in the basket. Deliveries will be made by either Fedex or DPD. Hopefully you won’t need to return an item of your order, if you do, we’re here to help. Firstly let us know. E-mail returns@alanwadkinstoolstore.co.uk, Telephone 01325 464452, Fax 01325 467330. Please have your invoice number to hand so we can deal with your request.